Tube List: 0A2 (1), 5Y3GT (1), 6AL5 (3), 6AQ5 (1), 6BA6 (6), 6BA7 (2), 6CB6 (1), 12AT7 (1), 12AX7 (1). 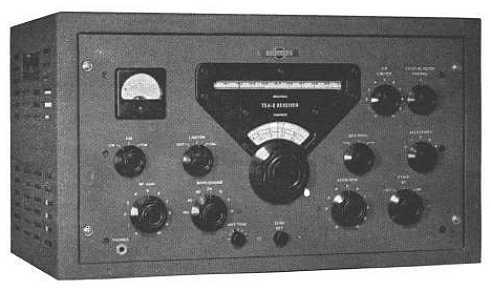 The Collins 75A-2 receiver is dual conversion and covers the 160 thru 10 meter amateur bands. Selectivity choices include five positions for the crystal filter (approximately 5 kc to 200 cps bandwidth) and that of the 455 kc IF transformers for AM operation. The crystal phasing circuit provides a tunable notch rejection for phasing out interference heterodynes. Operating modes for the receiver include AM, CW, MCW. Accurate tuning is accomplished through the use of a slide rule drum dial calibrated in .1 Mc and a vernier dial calibrated in 1 kc increments (2 kc increments on the 10 and 11 meter bands). Separate noise limiters are used for AM and CW operation. Front panel controls include: Band Switch, Main Tuning, Tuning Zero Set, On-Off-Standby Switch, RF Gain, AF Gain, Crystal Selectivity Switch, Crystal Phasing Control, CW-AM-FM Mode Switch, CW Pitch Control, Noise Limiter - Calibrate Switch, CW Limiter Control, and Antenna Trim. An optional 100 kc crystal calibrator (8R-1) is available as a plug-in unit. Other options include a plug-in NBFM adapter (148C-1) and external cabinet mounted speaker (270G-2). 115 vac, 50-60 cycles; power consumption is approximately 85 watts. 100 kc crystal oscillator (optional). Drift is negligible after warm-up and varies only slightly with line voltage variations. 2 uv for 10 dB signal-to-noise ratio. Audio output level is within 6 dB for an RF input change of 5 uv to .5 v. Delayed, amplified AVC circuit. 70E-12 permeability tuned oscillator (PTO). 50 to 150 ohms nominal (unbalanced, balanced). 2.5 watt at AGC threshold. Receiver: 21 1/8" W, 12 1/2" H, 13 1/4" D.